Would you like your homeschooling made easy? "My biggest frustration is the lack of straightforward answers or step by step as to HOW to homeschool. Not just 'ideas' behind what to do, but a structured step by step WHAT to do... at least for us beginners. Then we can branch off to do our own thing." Do you share her frustration? "I have Googled until I can't Google anymore!" It is easy to get frustrated and overwhelmed trying to figure out exactly what your children need to know - and how to teach it to them. Or even just deciding where to start. I can't find what is needed to actually do it. Honestly, where do I start? How can I be sure I am doing it properly? If you have information overload, let me help you draw a line under all that - and start afresh. How would you feel if an experienced homeschooler emailed you every week and told you EXACTLY what to do? What if you could get step by step guidance that got you up and running from the very first email - and then built on that every week. 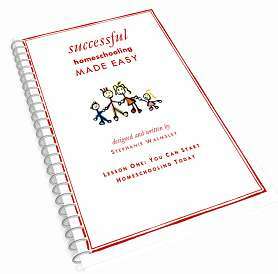 Successful Homeschooling Made Easy from Stephanie Walmsley, will teach you to make your own plan that will ensure you will be able to homeschool successfully from start to finish - in a way that suits YOUR family. This 6 month course gives you weekly emails - each one building up your skills as you go, and guiding you through those difficult first months of homeschooling. You will learn how to find your own personal style of homeschooling - but stay on top of record keeping, scheduling and lesson plans. I have taken a peek at Stephanie's course and I think it is perfect for new homeschoolers who REALLY want to understand what they should do.